Friday morning my sister and I were coming back to my house to grab lunch when I noticed we had a helicopter hovering over us. Because we are a growing community, my first thought was.."construction accident." Then I lifted my eyes up the street and what I saw made me break into a full sprint to grab my camera. Pretty cool! 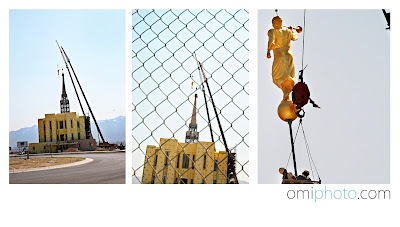 The Temple wont be compleate until March 2009, but it's coming right along! Great pictures Omi! We don't get to see that everyday unfortunately!